A friend had an interesting homily shared on his parish web site this past week. ("Thanks, Father Gene!") It made me think a great deal about the title of this post, "What is Church." My second thought reached into my academic inclinations, and I pulled out the Code of Canon Law, and read about what it means to be a pastor. Hardly an action of questioning my Bishop's wisdom, but more an action of wanting to prepare myself as best I could to serve the people wherever my assignment might take me. While canons 528-530 outline the responsibilities of pastors, Canon 771 uses the wonderful phrase, "pastor of souls." I liked that description when I read it years ago, and smiled again when I read it again in 2017. It reminded me of the phrase I embraced when studying spiritual direction, what the Irish monks called "soul friends." Pastors are called to be shepherds, managers, servants, priests, maintenance men, writers, mentors, editors, marketers, scholars, laborers, friends, adversaries, coaches, cooks, delivery men, first responders, advocates, teachers, disciplinarians, landscapers, ... oh, yes, and to pray as well. And this helps us understand "Church" as "parish," and "pastor" as "dispenser of the Mysteries of God" for all those we serve. This is a job that I love. Every day I know how blessed I am to play this role in the lives of my parishioners. These daily tasks enable me to each day know that I am getting away with something! 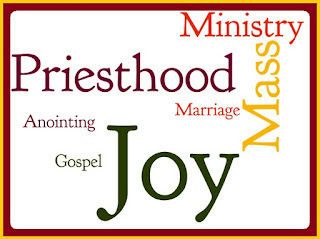 I get to serve God, through His people, every day ... to be a priest is a profound blessing in my life, every day. And yet we serve in troubled times; St. Peter wrote, "Now who is going to harm you if you are enthusiastic for what is good? But even if you should suffer because of righteousness, blessed are you. Do not be afraid or terrified with fear of them, but sanctify Christ as Lord in your hearts. Always be ready to give an explanation to anyone who asks you for a reason for your hope." • I get to baptize your children and grandchildren. I do this with you, often at our weekend Masses, so that our parish community celebrates together the next step in the fragile lives of these smallest of God's children, to share our hope and joy for the faith that will be shared with them by their parents, grandparents, friends and neighbors, from the people who join them in the pews each week, and who smile when your children squirm, cry, and sometimes run out into the aisle. (I always laugh - at least inside - when I see parents "sneak" up the aisle to retrieve them, wishing they were invisible.) I get to participate in this grace, as the hope for their children blesses each parent. • I get to celebrate the marriages of your children and grandchildren. I meet the most amazing young people, spend a year or more entering into their lives of faith and love, joining with their parents who have spent decades sharing their own faith with their sons and daughters. I get to befriend these young adults whose lives often transform over our time together, from a "memorized" faith to a prayerful relationship with Jesus. I get to witness the unfolding of God's hope and dreams for each couple as they become one in Christ Jesus. • I get to walk with parents and grandparents as illness enters into your lives with the Sacrament of the Sick. So often, I find myself the only person in your home, or hospital bedside, who is not family; I am graced by your tears, and witness tenderness and love that can only be revealed when wrapped in grief. And I get to speak with you and your loved ones, as you are dying. Through the powerful grace of God, I get to stand in persona Christi as we pray together about eternal life, and as I ask you, moments before you die, to pray for me when you enter the blessed realm of Eternal Life. I get to see first-hand my own faith and belief in God, my hope for growth in holiness that leads to Heaven unfold before me, in your life and death. • I get to serve you and Jesus Christ as a vehicle for the Sacrament of Reconciliation. In the words of this sacrament, "Through the ministry of the Church, may God grant you pardon and peace." Pardon, as Jesus commanded through His instruction to Peter to bind and loose on earth, and to invite God's peace to transform lives from fear to love, from darkness to life, to reflect once again God's dream for each person made in His image and likeness. I get to draw from the image of Simon of Cyrene, to help God's sons and daughters carry their crosses, and often, to leave their burdens of brokenness behind as lives are wrapped in the mercy and love of Jesus from Gethsemane and Calvary, moving from pain and hopelessness to hope and joy. • I get to break open the Word of God in our corner of the Church, in our town, in our parish for you, for your children, for your parents, friends, and for strangers. The words of the prophets, the Divine Revelation of Jesus Christ, the preaching of the Apostles all become light and life in our present day. Each Liturgy of the Word, each Bible study class, each retreat day, each evening of recollection, each religious education class visit become a chance to share the hope and challenge of the Word of God with His chosen people, those entrusted to my pastoral care. • I get to receive from you simple bread and wine, and to ask the Holy Spirit to transform what we see into what we believe, for you, your family and friends. St. Augustine held that simple host before his parishioners and proclaimed, "Receive what you are!" With feelings of awe, of weakness, of total inadequacy, I share with you what Jesus promised to each of us when He instructed us through His Apostles, this is my Body, this is my Blood; take and eat; do this in memory of Me. For you, my parishioners, I touch the transcendent reality of God, offered as food to lead us from emptiness to unlimited hope, from broken bread to the unity of life in Jesus Christ. • I get to become your soul friend, to offer spiritual advice along this pilgrim road we share together. Whether in one-on-one spiritual direction, or Backyard Theology sessions, whether teaching children, young adults, young parents, or senior citizens, as your priest I challenge you to discover Jesus' dream for your future, to encounter God in new and different ways. Each encounter allows you to be Christ to me, and me to be Christ to you; with the union of praying together, we mysteriously participate in the work of the Body of Christ. You help me to find God in all things, in all people, and to be surprised by what God has you say to me, and what He has me say to you. In your trust of me as your priest, I encounter more fully the hope that mirrors God, who is Love. I could do none of this without you, but every day get to encounter God with you. Peter said, "Always be ready to give an explanation to anyone who asks you for a reason for your hope." Because of my faith in God, you are my reason for hope; you are my reason for joy. Thank you for letting me serve you; thank you for praying for me, and for all those who serve faithfully as parish priests. Healing of Jesus Christ for our Church Throughout the World. On the Feast of St. John Vianney, August 4th, the patron of parish priests, our parish held a Holy Hour for an increase in vocations, with the acknowledgement that for vocations to succeed, we must first discover a healing in our Church. We began the Holy Hour with a plea to God for healing of our Church. The Church is broken; it is a human institution that reflects the brokenness of our original sin. For the thousands of years, since the time of Cain and Abel, humanity has lived a broken existence and we need to depend on God’s grace and mercy for our very existence. Our Holy Hour continued with prayers for young priests. 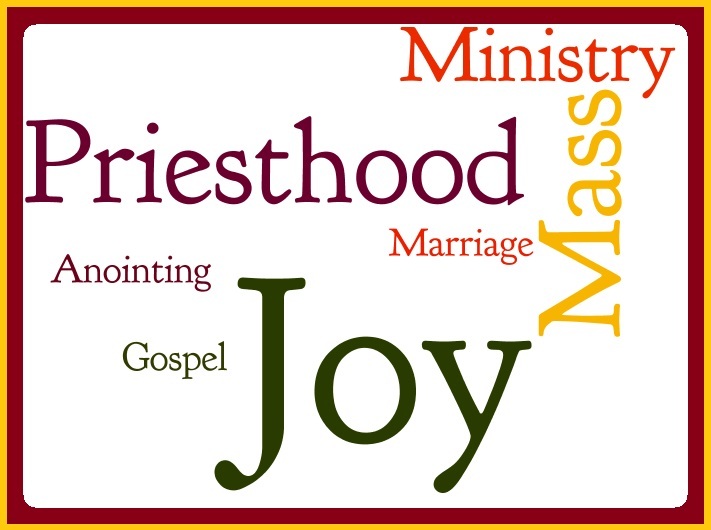 I may be a recently ordained priest, but certainly not a “young” priest. And those young men who have entered the ministry to the People of God in these past five or ten years have done so within a time that our secular society and culture would scream at them, “Why?” Why would you enter into the priesthood in the middle of such a scandal in our Church? The answer, of course, is that Jesus spoke to them, and to me, and said, “Come, follow me.” It wasn’t an easy decision for the early disciples, either; most died as martyrs. These young priests chose to be the presence of Jesus, to serve in persona Christi when we minister the sacraments. They invoke the power of the Holy Spirit to change simple bread and wine into the sacred Body and Blood of Jesus Christ. They have offered their lives to God, without counting the personal costs. Just as we must pray with confidence and trust that God - only God - can heal the Church, we must also pray with zeal our thanksgiving for these courageous men who will continue making Jesus present to our world - our broken, flawed, sinful world. Let us pray now with heartfelt thanksgiving for the gift of the Eucharist, where we come together, broken and hurt, but hopeful and hope-filled, with gratitude for the service of faithful priests and bishops. In our closing segment of the Holy Hour, we prayed that Jesus, the same God who will heal the Church, will send others to serve as priests. The young men who may be ordained ten years from now are today somewhere between 15-25 years old. If we imagine that for most priests, their journey through the formation of the seminary will take 4-5 years, and their discernment of the authenticity of this call from God may take 5 or more years, then we are asking God to touch the lives and hearts of these teenagers and twenty-something’s today. Yes, today, in the midst of a Church in desperate need of healing. But God can do that. Without priests, there is no Eucharist; without the Eucharist, there is no Church. Let us pray that Our Loving and All Powerful Father hears our plea to send us more priests, to send us more religious men and women who pray constantly for the Gospel to become our model of life, and that as we bow before the Eucharist today, that each of us surrenders to the gracious will of Jesus Christ, that we, the Body of Christ, will continue to joyfully serve Him. Our meditation as we closed our time before the Eucharist was with the hymn, “Come With Me Into the Fields.” The harvest that is the fruit of seeds planted by God is before us; He has chosen us to be disciples, and He has chosen some to the vocation of priesthood. May we, the Body of Christ, implore our God to grant a future full of hope. The final Eucharistic adoration hymn was“Take Lord, Receive.” Not a traditional Benediction hymn, but certainly one that offers ourselves back to God, in thanks for all He does for us: “Give me only Your love, and Your grace, that’s enough for me!” In the words of our Eucharistic prayers, we unite ourselves with the sacrifice of Jesus, we make of ourselves an oblation to God. We are decades away from the fruits of God’s healing to become a reality in our Church. Not that we cannot start now, but the pain, the hurt, the injury of decades will take more than a little time to become a reality in our human institution of The Church. Let us never forget that it is Jesus’ call and invitation to become “church,” to enter into “communion” with one another. I will not abandon the Church; I will struggle to forgive those who have abused their power and position, and abused children or young adults. But I will forgive. I will trust Jesus to be the only judge. And I will be thankful for every moment that our Church is an instrument of justice and peace for any who were abused. That is what Jesus has commanded us to do.